The 2015 Emmys are right around the corner, and, despite my overall lack of enthusiasm about this year’s crop of nominees (If you don’t nominate The Americans for any major awards, you lose most of your credibility in my eyes. ), there are still some categories that I have a very deep rooting interest in. I’d love for Andre Braugher to get some recognition for what is one of my favorite performances on a comedy right now. I’m downright giddy when I think about seeing Tatiana Maslany’s name listed in the Best Actress in a Drama category. And I’m ready to ride the “Poehler or Bust” train for one last year in the Comedy Actress race. And while the category I’m most invested in is also probably the category most likely to disappoint me, I’ll keep hoping that Emmy voters got a little sentimental this year with their pick for Best Comedy Series. This is their last chance to acknowledge what so many of us know to be true: Parks and Recreation deserves its time to shine, its time to stand among the best of the best—where it rightly belongs. This wouldn’t even be a clichéd, undeserved “body of work” award like you sometimes see final seasons get at these kinds of shows. The last season of Parks and Rec was one of its finest—a fitting end to a show known not just as a great comedy but a great television show that was beloved by fans, respected by those in the industry, and adored by critics. What do you want in a television comedy? Laugh-out-loud moments? Parks and Rec had those in spades. Smart satire? That was often this show’s claim to fame. Multifaceted characters who aren’t boring? Parks and Rec had the strongest ensemble and the most interesting cast of characters in the current TV comedy landscape. Relationships to root for? This show made you care about every relationship—from the central ones (Leslie and Ben, Leslie and Ron, Leslie and Ann, April and Andy…) to the surprising ones (April and Ben, Tom and Donna, Andy and Ron, Ann and April…). Female characters who exist as more than just love interests? CHECK. Moments that move you to tears? Parks and Rec made me cry more than 99% of the dramas on television. This show was the total package. It was also a game-changer. Look at shows like Jane the Virgin, The Unbreakable Kimmy Schmidt, and Playing House. They might never have existed without Parks and Rec. With Leslie Knope and her big heart at its center, this show set out to prove that comedies didn’t have to be cynical or mean-spirited to be funny. Good people doing good things can be entertaining for not just a season but for years. And it succeeded, paving the way for other critically-acclaimed shows like those I listed above. Parks and Rec took big risks. That doesn’t mean it was “edgy;” it means it actually dared to defy television conventions to tell stories its writers believed in. Its characters got married and stayed married. They had babies and struggled with the decision to have babies. Whole episodes were devoted to female friendship—and male friendship, too. They talked openly and honestly about their emotions instead of withholding them for the sake of the show’s plot. Parks and Rec dared to believe that people in fulfilling, stable relationships (both romantic and platonic) could be the center of a great television show. That’s as big of a risk as it gets in the entertainment industry. This show left an indelible mark on pop culture over the last seven seasons. Treat Yo Self. Galentine’s Day. Ron Swanson. A direct correlation between waffles and badass ladies. Without Parks and Rec, these things wouldn’t exist in our collective consciousness, and that kind of lasting influence on pop culture deserves some kind of professional recognition. 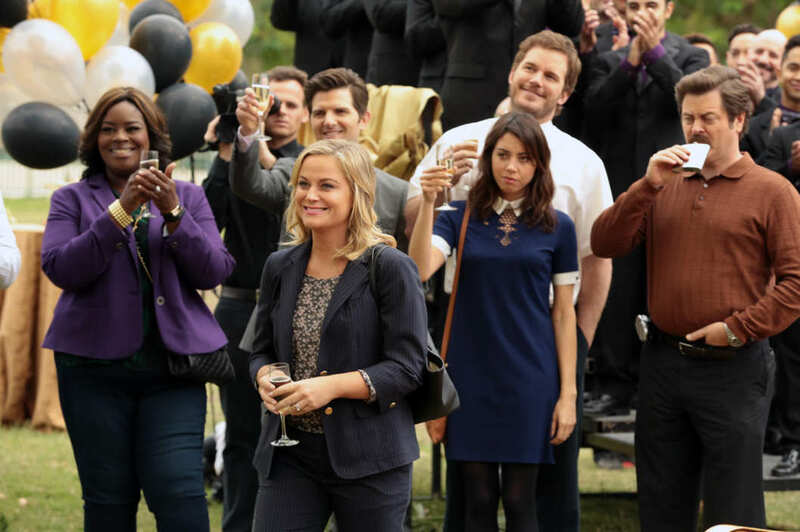 Ultimately, Parks and Rec wasn’t built to be a show for Emmy voters, and that was part of its charm. It was the lovable underdog that wore its heart on its sleeve, like Leslie Knope going up against Bobby Newport in the Pawnee City Council election of Season Four. But Leslie earned her big win at the end of that season, and it’s time Parks and Rec earned its big win, too. Sometimes nice guys finish first. I hope this Sunday is one of those times. This is your last chance, Emmy voters. Don’t screw it up. Who will you be rooting for this Sunday night during the Emmys? Let us know in the comments! This entry was posted in Awards Season, Fangirl Thursdays, Television and tagged awards season, emmy awards 2015, fangirl thursdays, parks and recreation, television by Katie. Bookmark the permalink. I didn’t even realize the Emmy’s were coming up! Shows how little I really care about them, I guess, especially after years of great shows being ignored and the same old people winning. I love my TV but I don’t much care for awards. I don’t hold out much hope, but I agree that in a just world Parks would get recognition, for all the reasons you said. And Andre Braugher. And even though I haven’t watched her show yet, Tatiana Maslany, finally. Because I can tell from my second-hand watching that she must be beyond amazing. Ok, I just went and read Heather’s post and now that I actually know who’s up for what… I would love to see Viola Davis win for HTGAWM. I haven’t watched very many of the other shows in the running (for any of the categories) so my picks are very biased. But Davis is amazing and I’m glad she got the nomination even if Maslany probably should get the win after all this time being snubbed. Luckily I won’t be watching so I won’t be too upset if all my picks lose. Sometimes it feels like everything I love and care about loses – in political races as well as awards shows. I’m always happy to remind people about award shows! 😉 They’ve always been some of my favorite days of the year, even though I usually end up disappointed—especially with the Emmys. I actually think Viola Davis has a much better chance to win than Tatiana Maslany (I think they’re going to feel her nomination was recognition enough for a “genre show.”), so maybe you’ll get to see someone you love win! I’d love it, too, if Davis won. I might not watch the show anymore, but I did see her stellar work during the first half of S1, and she’d be a worthy winner for sure. “Sometimes it feels like everything I love and care about loses – in political races as well as awards shows.” – You sound like a Buffalo sports fan, right now! This is exactly how I was raised, so I understand this feeling on a deep level. Here’s hoping someone we love wins soon! I want Parks and Amy Poehler to win so badly. This was truly a special show and it’s still ridiculous to me that Amy hasn’t won an Emmy for it yet. I would like them to be officially recognized for their place in the TV landscape and on a selfish note, how wonderful would the acceptance speeches be? Those acceptance speeches would be perfect. Amy’s made me cry at the Golden Globes, so I can only imagine what a mess I’d be if she actually won an Emmy—of if the show did and she got to talk. I would love to see Parks win, as well as andre braugher and tatiana, but I am mainly just along for the ride. I’m trying the “just along for the ride” mentality, too. I’m really looking forward to Andy Samberg, and whatever happens, I’m ready to be entertained.